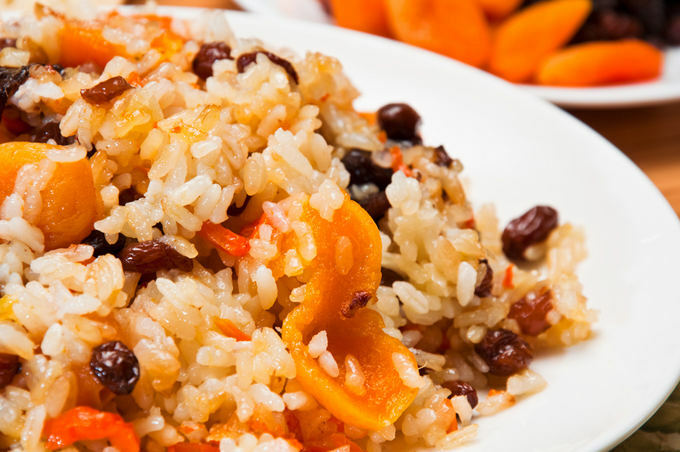 Pilaf with raisins and dried apricots - the dish is quite interesting in taste, therefore, all wishing to please his household unusual dish is sure to make it. Preparing this risotto is easy and simple, the main thing - to have available all the necessary ingredients. - 100 ml of vegetable oil. Thoroughly rinse the rice in cold water at least three times and be sure to water when washing should be absolutely transparent. Once the rice is washed, fill with cold water and leave for 30 minutes. Onion peel, wash and cut into thin half-rings. Carrots clean, grate the roots on a grater (preferably use a grater for carrots in Korean, in this case, the vegetables in the finished dish will be more pronounced). Pour the raisins and apricots with hot water and let stand 10 minutes, then carefully wash fruits in cold water. Pour into the cauldron or saucepan with oil, put on fire. In warmed oil put both kinds of peppers, cumin (or cumin), ground coriander. Seasoning-heat oil (required to ensure that the oil does not boil), after the aroma of the spices will be quite strong, add the chopped vegetables: first, put the onion and sauté it for two minutes, then put the carrots and fry until soft. Drain the rice water, put it to the vegetables. On low heat evaporate the excess water from cereals. Dry apricots and raisins, after which chop the dried apricots in a random order. Add to rice and dried fruit and a pinch of turmeric (the spice will give the dish a nice color), stir and warm over low heat. Pour into the cauldron five glasses of boiling water, add salt and add the sugar (to taste), turn up the heat to maximum. Once the rice has absorbed all the water, close the pilaf with a lid and leave to simmer on a slow fire for 30 minutes. After a specified time turn off the heat and arrange the dish on plates and serve, align to, for example, natural yoghurt homemade.